I was glued to the television at the weekend, watching the 100th anniversary commemoration of the Battle of Third Ypres, better known to the British as Passchendaele. My brother was in the audience at Tyne Cot cemetery. He was one of four thousand people with family in the battle who had won a seat in the ballot and had been invited to attend the ceremony. He was remembering our great uncle, 2nd Lt S.H. Hawksworth of the King’s Liverpool Regiment. Stanley Hawksworth was 21 when he vanished in the early hours of 20 September 1917. He was leading his platoon forward in a battalion attack during the Battle of Menin Road. Stanley disappeared somewhere in the fighting and was never seen again. It’s an all too familiar story. September was a dry month at Passchendaele, but it had rained all night before the attack. The terrain was pitted with shell holes full of water as the battalion advanced. Great uncle Stanley was probably killed by a machine gun before he got very far. No one saw him die. His body was never found. Perhaps great-uncle Stanley was one of them. He fell too late in the war to have his name inscribed on the Menin Gate at Ypres, so all that remains of him now is a name on the wall at Tyne Cot. 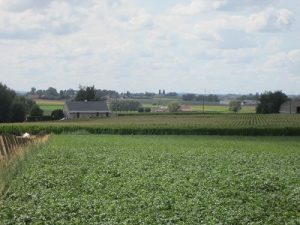 The best hope for his family is that one day his remains might be dug up in this field between Ypres and Passchendaele. Then we can bury him properly and give him the honour he deserves.